Helps plants quickly grow new strong roots! The most important stage in establishing a new lawn is when grass first starts putting down new roots. New roots have special needs which are different from established lawns. New developing roots from seedlings and plugs have difficulty obtaining the necessary nutrients, from all types of soil. Key among these are nitrogen and phosphorus. 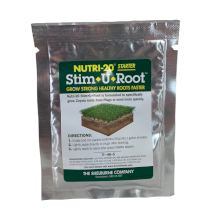 Stim-U-Root is especially developed to provide these and other nutrients in a form new roots can use (see the Stim-U-Root Label for details).